I have a 35 Johnson (burgundy & white)...it's a pull start. Can it be converted to electric, and with what parts? 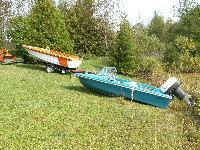 I am hopeful the Johnson and Evinrude experts find your post to help you. To increase your odds of finding more people, maybe consider also posting this under the J.E.G.O. Forum. The first 2 letters of that stands for Johnson. Evinrude. You will need the flywheel with ring gear (if you don't have one already), a starter mounting bracket for your motor - unique to the 1956-1958 Johnson 35s, the starter motor (any of the 12V Big Twin OMC starter motors should work from 1956 on up), the carburetor from an electric start 35 (1957-1959), and electrical wiring for same. Depending on how "correct" you want it to be when you're done, you may want the belly pan from an electric start 35 with the side plug, too, as well as the solenoid box and harness. Getting the electric start model's carb is simply easier than trying to add all the bits from one to your existing carb. It'll include the choke solenoid, carb bowl with mount, and all linkage bits. I just did a 1958 conversion and it worked beautifully. If the carb you get comes from one of the Super Sea Horse 35s with a bucket cowling, you'll need to swap your longer needle valves and air horn over. Get yourself a copy of Max E. Wawrzyniak's book CHEAP OUTBOARDS: The Beginner's Guide to Making an Old Motor Run Forever. - The directions to do that conversion to electric-starting are in that book, plus a great deal of other great information that even "non-mechanically inclined" folks like me can follow successfully. Amazon.com & ebay.com (as well as many other similar vendors) have copies. - Cheapskate that I am, I paid 5.oo for my copy at a Salvation Army thrift store.